You Kikkawa to release her new track “NEO SUGAR SUGAR YOU” and past catalogue on digital service worldwide on May 23. You Kikkawa co-wrote the new track aiming to be anthem-like song for her fans. In addition to download services, her catalogue will be available to streaming services such as Apple Music, RECOCHOKU BEST, LINE MUSIC, Spotify, AWA in Japan. Stay tuned for more info for her 8th year career continues. With your continuous support, I’m going to release digital only track NEO SUGAR SUGAR YOU. I’m so happy to hear that this will be released in 200 countries and areas globally. I hope a lot of people will enjoy and like my new track. This track was written by Akasick however, as a challenge to myself being 26 years old, I was involved in writing process from the beginning. It was hard for me to image what king of music style would be suitable for me to perform. Finally it became clear when I noticed that I needed a up-tempo song which would be a key song at festival and gigs. This track is a band oriented rock track that drives wild at summer festivals! I want everyone to sing along, especially the part that sings “YOU” which is my name! 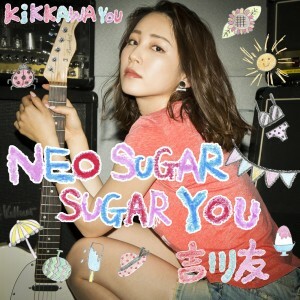 「NEO SUGAR SUGAR YOU 」 has everything You Kikkawa wants to sing now. Let’s drive through this hot summer singing together! Please enjoy this track, and thank you for your continuous support!! Copyright © UPFRONT-CREATE Co., Ltd. All Rights Reserved.